As promised, here are a few pictures of the Doodah Parade, part of the Ilion Days festivities in Ilion, NY. 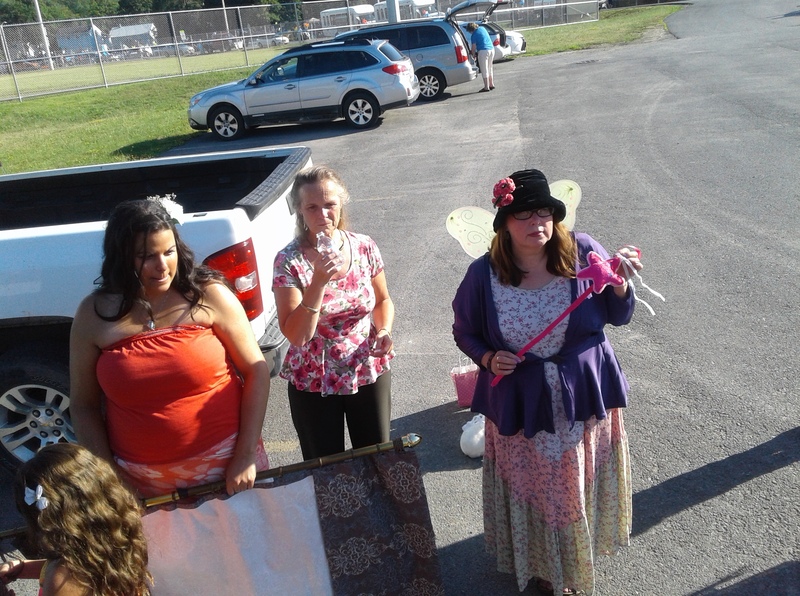 As a matter of fact, they are not of the whole parade but only of the Ilion Little Theatre contingent. During the parade, I could not take a decent picture, because I was riding in the back of the pick-up truck. I had enough to do to keep my own balance (with one epic fail). Oh, I know, I could have sat quietly in the lawn chair, like I did last year. But I was a wizard (in a witch hat). It was more fun to wave my arms around casting spells on people. 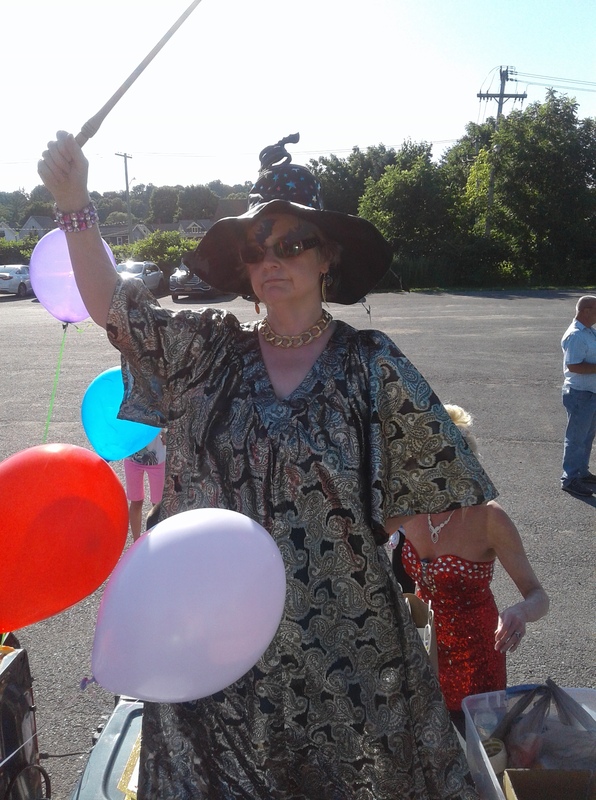 The witch’s hat, sunglasses, necklace and bracelet were new additions to the costume since I wore it for the March of Dimes March for Babies. The utterly fabulous red dress you can see in the background is my friend, Kim, who I stupidly did NOT get a picture of. In my defense, it’s hard to take pictures with a Tablet in the bright sun; I can barely see the screen. But I got a few snaps. Alas, I don’t know how to crop, so the pirate family cannot be centered. When I used to work for a newspaper, we cropped with an Exacto knife and a ruler. That’s how old I am, in case you needed a reminder. 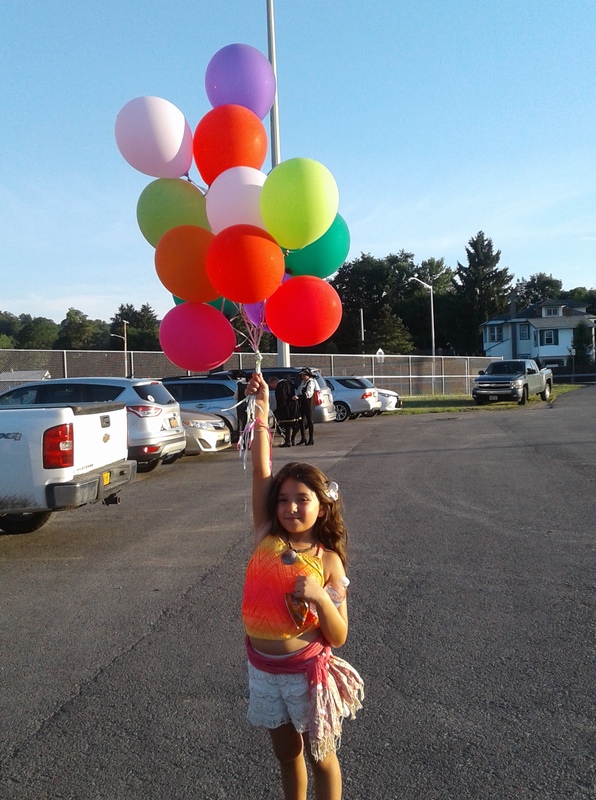 Luckily I got the shot before the balloon blew in front of her face. I don’t know if you can tell how fabulous this costume was from the picture, but I liked it. 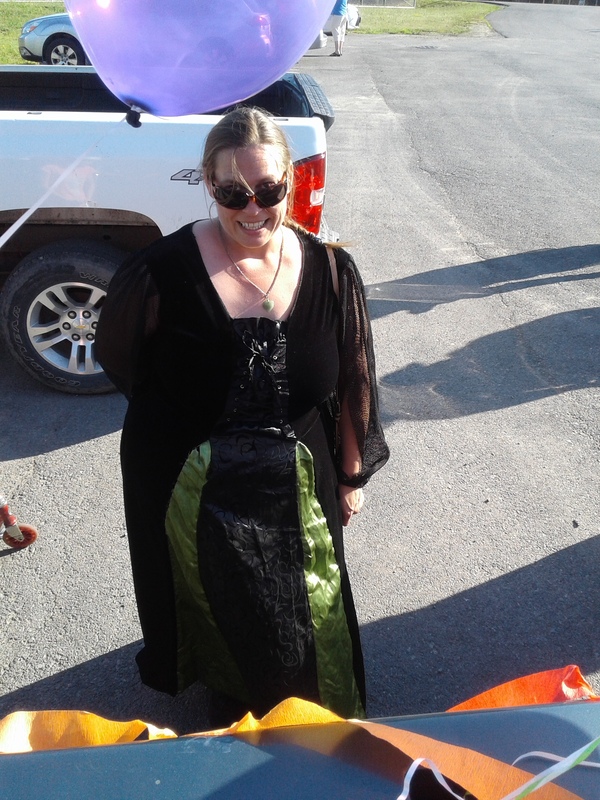 The lady wearing it said it was not too warm, despite being dark, because the fabric was lightweight. Just a couple of candid shots. Despite appearances, she did not float away. 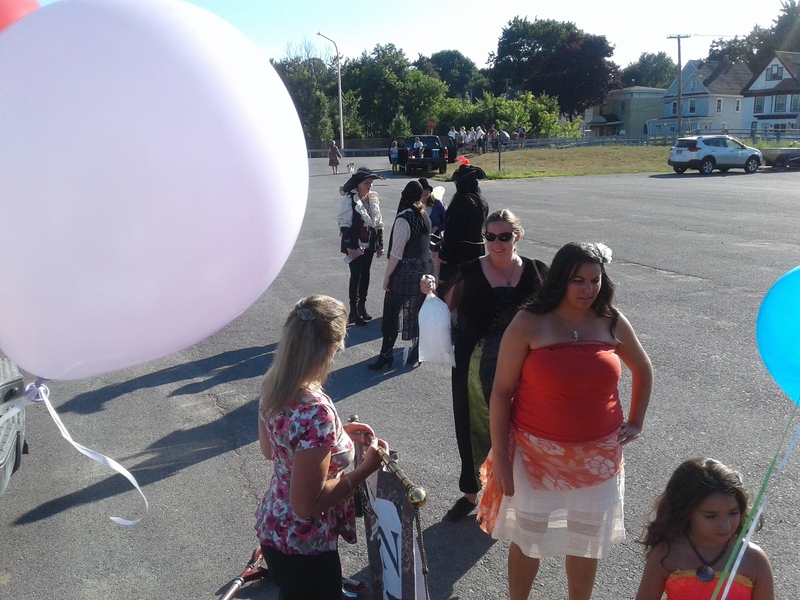 This was after the parade, when we took all the balloons off the truck. Last year, the girls got into letting them float away in memory of loved ones who passed. I did not like to discourage them at the time, because it obviously meant a lot to them to do so. However, this year before anybody got that idea, I pointed out that it is very bad for wildlife and the environment. So this sweet young lady ended up with all of them. Of course we were properly identified. This is last year’s banner, but it worked perfectly well. It is a little wrinkly, because it was in the backseat of Kim’s vehicle as we drove to the parade grounds, and I could not keep from leaning against it. Her car was a bit crowded, but I was grateful for the ride. 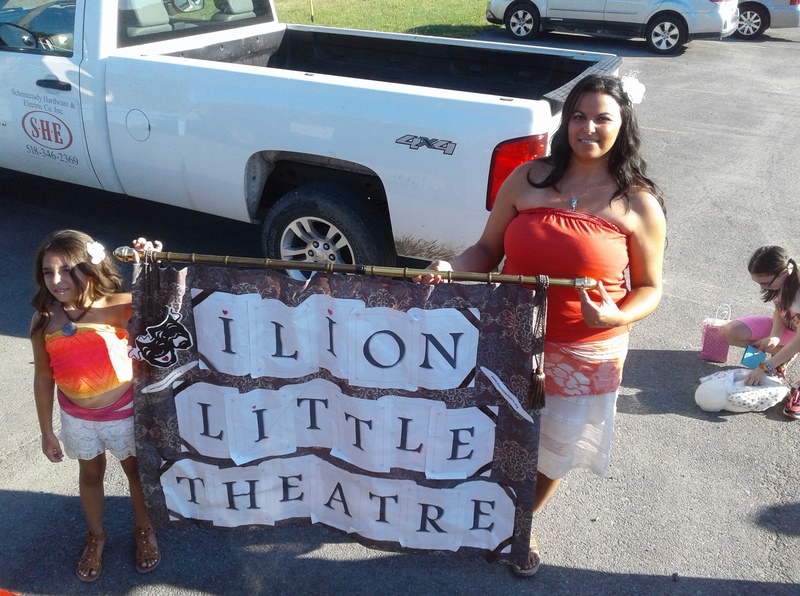 So one more Doodah Parade is in the books for Ilion Little Theatre. I hope some of the people who enjoyed our “float” come to see some of our shows. 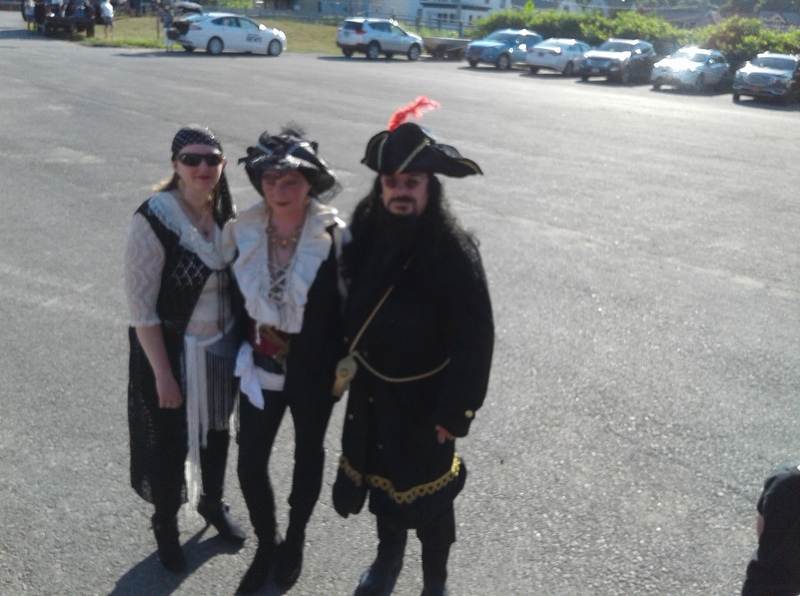 Posted in Community Events, humor, personal and tagged community theatre, costumes, DooDah Parade, float, Ilion Days, Ilion Little Theatre, Ilion NY, parade, wizard costume. Bookmark the permalink.